We focus on your racket, so you can focus on your game. Restringing your racket can be a hassle. You rush to the shop after work or on the weekends when you should be on the court playing. Then you return to the shop after the racket is strung. Hopefully, you find a parking space. Forget this nonsense. We offer two convenient options. You can drop-off your racket at one of our two convenient locations in Arlington or Falls Church-Merrifield. Regardless of the option you choose, we hope this will allow you to spend more time on the court and less time worrying about your tennis gear. Upon request, same day service may be available. Wilson Rackets, Nike Shoes, and More! Capital Stringing & Tennis is thrilled to offer the best gear for your on-court and off-training training needs from some of the world's best tennis companies. 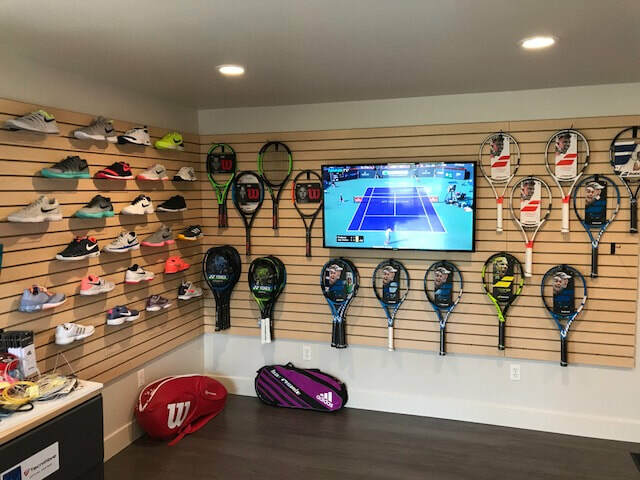 Visit our Falls Church location to try on a pair of shoes or demo a racket. Please contact us for details for how we can help your tennis league, running club, sorority or fraternity, high school or college sports team! Below is a modest display of some of our products!